I find that lately I am more and more inclined to go local. This has been true about food for a while now, but lately I’ve been thinking more and more about supporting local people in other areas as well. It’s not that I don’t love a lot of our out of country brands like Blue Sky and Rowan, but it’s nice to support the small local guy as well. One of the local artists we like here at Urban Yarns is Dale Ramsey. 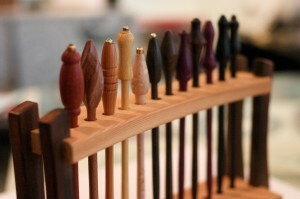 Dale creates beautiful wood shawl pins and closures by hand. His closures are really works of art. They are sculpted to the body and are made of instrument wood. The finish on them, aside from being stunning in colour, is the same finish they use on cars, so the colours won’t run in our rainy Vancouver weather. There are all kinds of beautiful shapes and colours to choose from, so there is undoubtedly one that goes with the shawl or sweater you may have just finished. 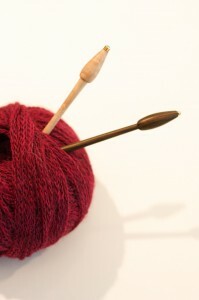 The latest addition we have acquired are Dale’s shawl pins. They are simple and elegant but they too have a bit of a story behind them. 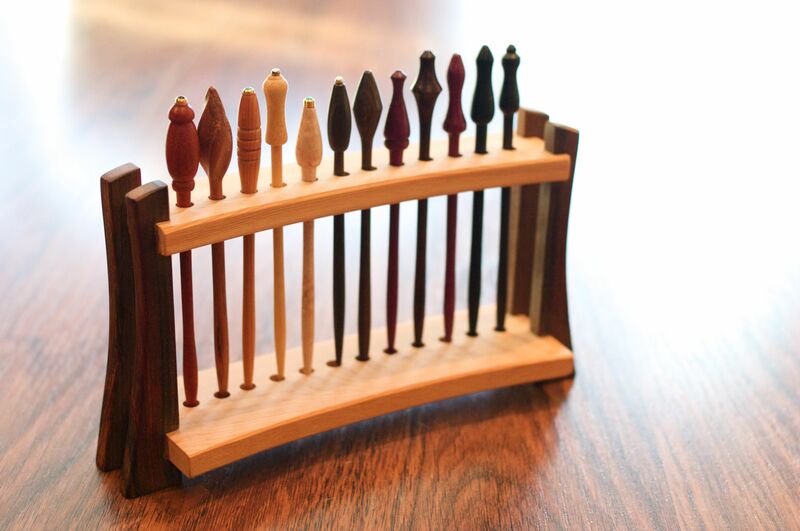 They are made from exotic woods from around the world in all different colours. 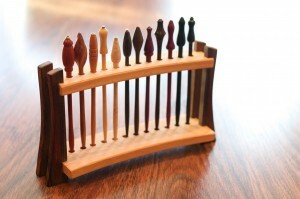 These, however, are not coloured after they are created, the colour exists in the wood itself. Some of these exotic items include Birdseye Maple from Easter North America, Purple Heart from Costa Rica (my personal fave), Ebony from Africa, Yellow Heart from Guyana, and Coco Bolo from Central America. These pins are a great treat for yourself but they also make a really great gift for the knitter who has everything (you know who I’m talking about here). It’s something unique, special, and local. This entry was posted on Monday, November 1st, 2010 at 10:40 pm	and is filed under Uncategorized. You can follow any responses to this entry through the RSS 2.0 feed. Both comments and pings are currently closed.